Join a grizzly old prospector on the hunt for treasure in Diamond Mine. This mining-themed slot game from Blueprint Gaming is played using a 6 reels, cascading reels game engine. It uses Big Time Gaming’s MegaWays technology where the number of ways to win alters with each spin. The game also comes with transforming symbols and a free spins round with expanding multipliers. Stakes range from between 20p and £100 per spin. This isn’t the flashiest slot game you’ll see as far as design goes but the cartoon visuals and banjo-heavy backing track certainly conjure up the feel on the wild west. Set against a desert canyon backdrop and flanked by cactus plants, the mineshaft reels include A to 9 royal values as well as shovels and axes, lamps and a bearded prospector. The most lucrative symbol is the diamond which pays 50 times your total stake if you find 6 on adjacent reels. Helping to create winning combinations is the dynamite symbol. This wild substitutes for everything bar the scatter and can hit on all 6 reels. Also helping you chances are the barrels of TNT. When these land, the Mystery Symbol feature is activated - they all transform into the same matching symbol and a new payout combination is made. The game is played using the MegaWays game engine where the number of ways to win changes with each spin. Each reel can feature up to 7 symbols. If you get the maximum sizes reels, you’ll spin with a mammoth 117,649 ways to win! After every successful combination, the winning symbols are blasted away (with sound effects to match) and new symbols drop in and replace them. A new payout calculation is then made. If you’ve landed another winner, then the process is repeated. These cascades continue until you don’t create a winner. Diamond Mine also comes with a Free Spins feature - landing 4 scatters will get you 12 free spins. Each extra scatter on the triggering spin adds another 5 free spins to that total. Every time you land a cascade win during the feature, the multiplier increases by 1x. Hope to see scatter in the single reels above the main set as landing 3 or 4 of them will get you another 5 or 10 free spins. We enjoyed Diamond Mine. The madcap design work well in combination with the MegaWays game engine which delivers plenty of action. The bonus round offers some decent potential too thanks to the expanding multipliers. 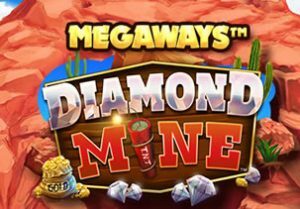 It’s certainly not the most sophisticated slot game you’ll come across but Diamond Mine offers simple and potentially explosive entertainment. If you like the mining theme, Dwarfs Gone Wild by Quickspin is a great option.